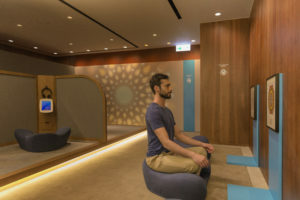 A visit to Cathay Pacific’s Business Class lounge at The Pier in Hong Kong has just become even more beneficial for mind, body and soul following the opening of The Sanctuary by Pure Yoga. Designed in partnership with the Pure Group, The Sanctuary by Pure Yoga is a 700 sq ft area divided into two zones: The Body Sanctuary, which is dedicated to yoga, and The Mind Sanctuary, where travellers can meditate to focus and calm the mind. Among the wellness offerings, The Body Sanctuary provides travellers with a space for gentle yoga with guided videos led by Pure Yoga teachers. There’s also a secluded space for self-practice. Seated stretching is an alternative option; chairs overlook instructions on how to stretch different parts of the body whilst seated. The exercises are designed to improve circulation, enhance joint mobility, and relax the mind for a comfortable and restful journey. Two types of meditation on offer within The Mind Sanctuary. 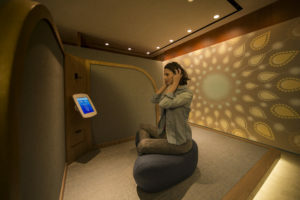 The first is audio meditation: four cushioned pods are equipped with noise-cancelling headphones and iPads, and customers can listen to guided meditation sessions narrated by Pure Yoga’s expert teachers. The second is gazing meditation: comfortable cushions overlook graphics placed on the wall ahead and facilitate Trataka yoga practice. The Sanctuary by Pure Yoga is the latest collaboration between Cathay Pacific and the Hong Kong-headquartered Pure Group following the January 2018 launch of ‘Travel Well with Yoga’, a series of inflight videos to help passengers ease into their journeys with meditation and yoga. Additionally, Diamond and Gold Marco Polo Club members arriving in Hong Kong on Cathay Pacific or Cathay Dragon flights are given complimentary one-day access to any Pure Fitness centre or a choice of any Pure Yoga class up to 12 times a year. The Sanctuary by Pure Yoga is open to travellers who have access to Cathay Pacific The Pier Business Class Lounge at Hong Kong International Airport, as well as Diamond, Gold and Silver Marco Polo Club members. Cathay Pacific and Cathay Dragon First and Business Class passengers will also be able to enjoy the new offering. 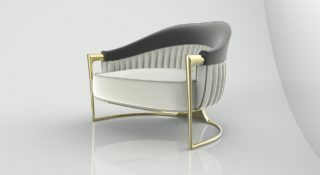 Award-winning interior design firm Steve Leung Designers has appointed Sinclair to drive an integrated brand awareness strategy in Hong Kong and China. 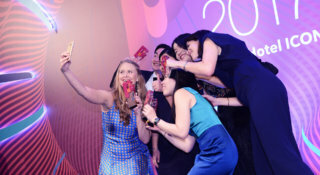 Independent PR agency Sinclair took home seven trophies at Marketing Magazine’s annual awards ceremony.